The last few cakes I have made have been quite heavily laden with frosting or cream and butter. 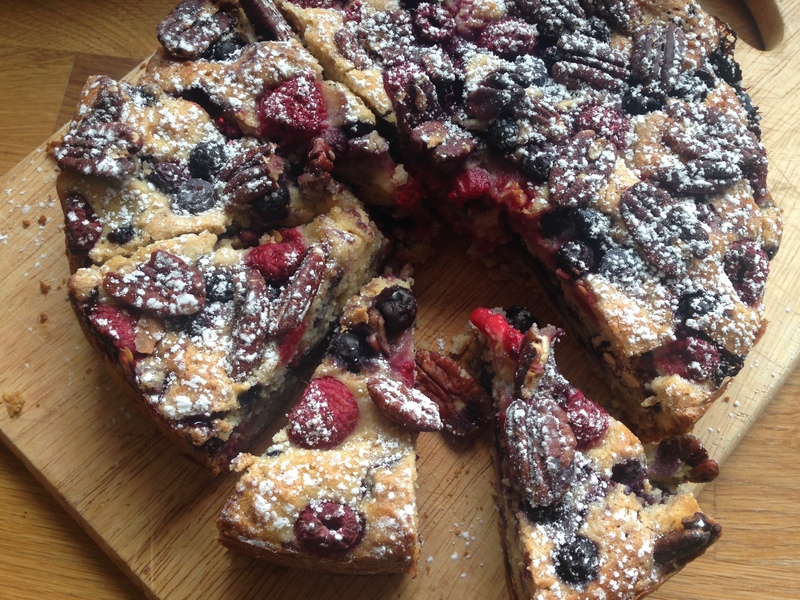 So with the weather changing and it becoming brighter and fresher outside, I wanted to make a cake that was a little bit lighter and less calorific. The muffin cake, takes little time and can be adapted to each persons taste. 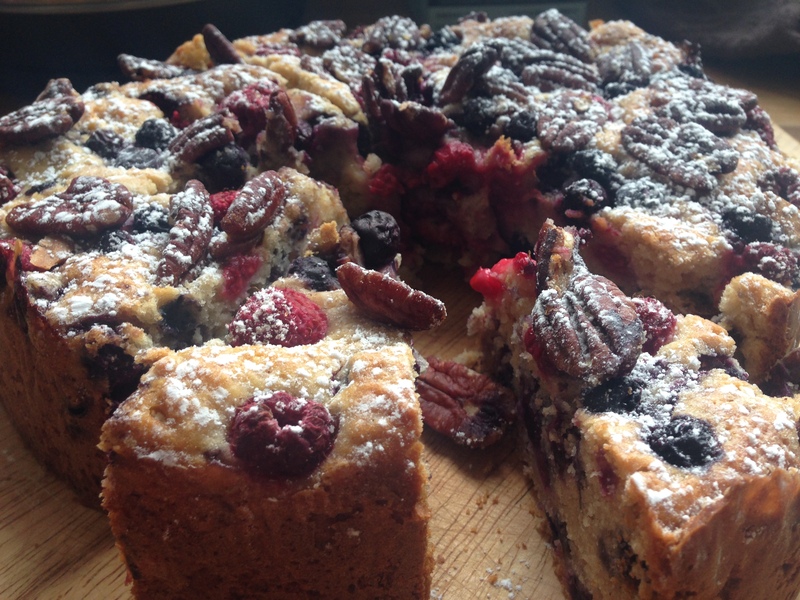 I like to use a mix of blueberries and raspberries and pecans. But use whatever berries and nuts you like. The secret with this cake is to whisk the wet ingredients really well and then just quickly fold the dry ingredients in. This helps it stay light and fluffy. Pre heat the oven to 190 C (170 C fan oven). Grease and line a 20cm round cake tin. Sift the flour, cinnamon, salt and baking powder into a small bowl and set aside. 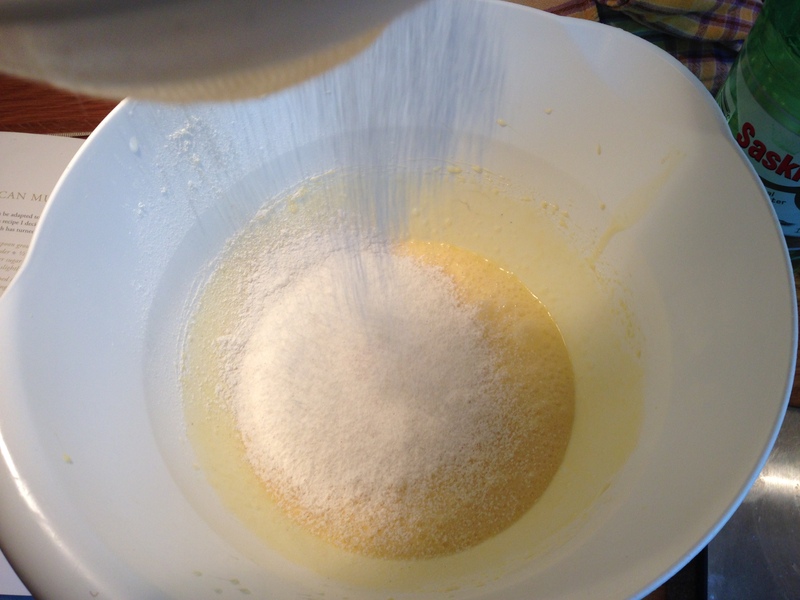 In a large mixing bowl, whisk the sugar, eggs, melted butter and milk until creamy and fluffy. Then sift (for a second time) the flour mix on top of the wet ingredients. Make sure to life the sieve up high to give the flour a good airing. Fold the dry ingredients in gently and quickly (about 15 seconds). Don’t worry about any lumps, this is characteristic of a good muffin. 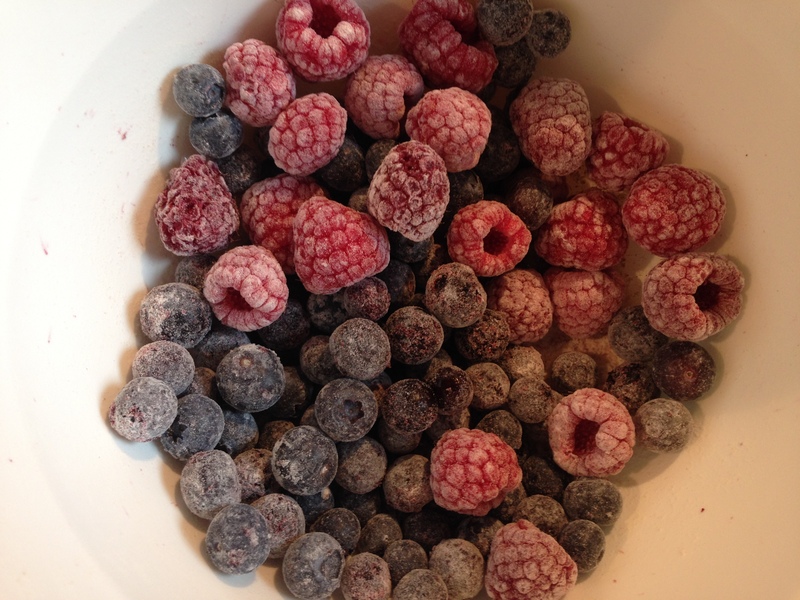 If you are using frozen berries, pop them in a bowl with a tsp of flour and give them a mix to coat the berries. This stops the berries from sinking to the bottom and also from staining you batter with red and blue streaks. 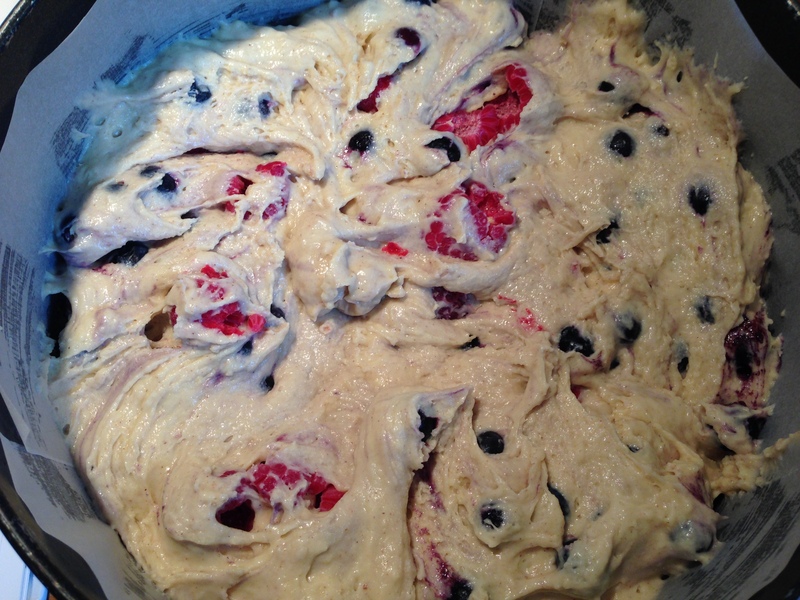 Tip the berries into the batter and mix roughly. Pour the batter into the prepared cake tin and smooth out. 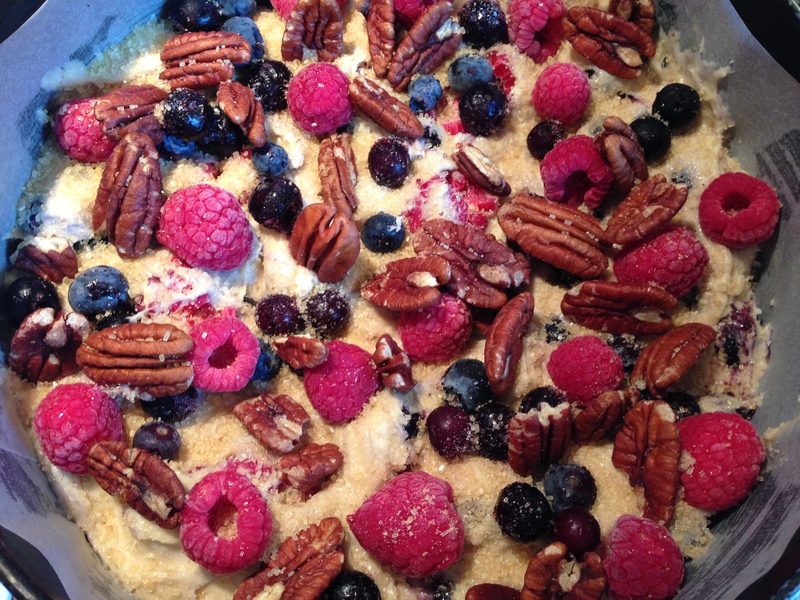 To top, scatter the berries, pecans and then sprinkle the sugar over. Pop in the oven for 55 minutes. After 40 minutes, check the cake (open the door only a little). If the topping is browning too much, you can cover lightly with tin foil for the remaining minutes. Take out of the oven and cool in the tin for 30 minutes. Then transfer to a wire rack to cool fully. Dust with icing sugar and serve with cream or natural yogurt.